Annual LifeSciences BC – Sauder MBA Internship for Life Sciences Companies in B.C. 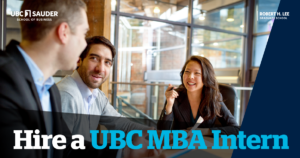 The Sauder School of Business MBA program is one of Canada’s finest. Its graduate students are strategic thinkers, with analytical minds, eager to put to good use the sophisticated, leading-edge business practices they have acquired while studying at UBC’s preeminent business school. This is your opportunity as one of BC’s employers, to hire for a summer’s duration, the keen mind of a Sauder MBA student. The interns have proven their worth over and over again by saving sponsoring companies critical dollars in lost revenues by implementing process efficiencies, managing new product development with innovative marketing tactics, while consulting on numerous business issues during a normal 40 hour work week. Diversity of Student Population: 58% international from 29 countries. Languages spoken: 71% of the students speak two or more languages.